Location : North West Béziers, in the Hérault District.The 20 villages of the AOC describe a kind of circle going up to the North until the Cévennes Mountains. 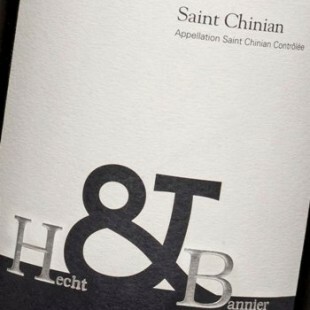 We first focus on finding the areas where the Syrah presents a floral and liquorice bouquet. In that AOC, two types of soils. To make it simple, schists on the northern bank of the river Verzanobre and limestone clay on the southern bank. They are in complete opposition and produce wines that often have few things in common. Limestone clay areas : all this lower part of the AOC where the long limestone slabs are usually North South oriented. Based on this subsoil one can find, bauxite, sandstone and depending on the area, more or less clay. Mediterranean influence is here stronger. Schist areas : they are all the northern part of the AOC. Soils are here poor and very acid but in depth, some pockets of clay which better retain water can be found. Here are born Berlou and Roquebrun Crus whose legislation requires a large proportion of Carignan in their final blends. Sandstone area : the opposition of these two types of soils has to be shaded by the determinant role played by sandstones in the western part of the AOC. For heatwaves vintages, when some varieties so much suffer from dryness that the ripening process is stopped, vines on sandstone soils often present some optimal phenol indexes, especially on Syrah. The Languedoc hinterland has this typical Mediterranean climate made of long hot and very dry summers. Rains for most of the time are storms during spring or fall. The Mediterranean Sea which is as the crow flies, only 20km far from the vineyards, plays an important role as soon as southern winds bring some humidity on the vineyards. 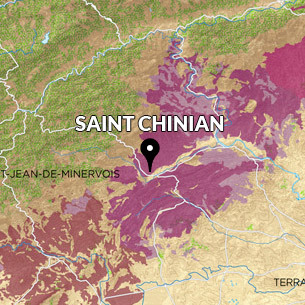 As far as we are concerned, the Saint Chinian AOC remains an extraordinary wealth of great wines and an ideal field to develop our skills on blending and maturing. Depending on the character of a specific vintage, we always have the opportunity to play on differences and complementarities of various terroirs, but also on the typicity of each variety planted. Each year, we first focus on finding the areas where the Syrah presents a floral and liquorice bouquet. Then we complete the blend with the best expressions of Carignan, Grenache and Mourvèdre when the vintage allows it.